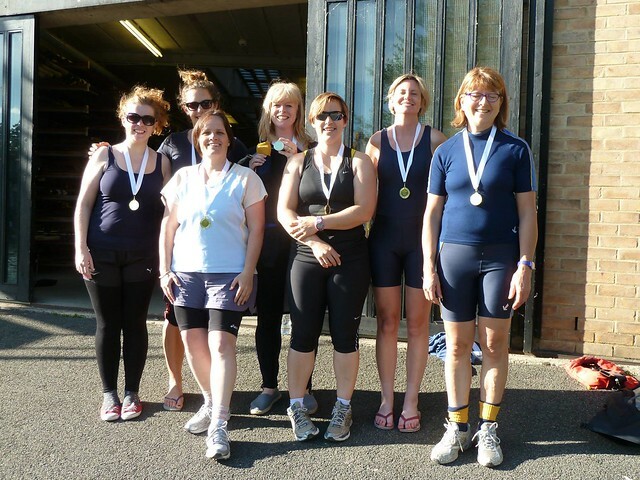 We put in two mens and two womens crews into the Xpress head on June 3rd, and the W1 crew, pictured, won the W Nov category, so well done to them! The race is over the "bumps course" which they interpret as "just past the motorway bridge" to Peter's posts (ie, the two iron posts that mark the start of the towpath, just after the bay by the Piek and Eel). You could do a standing or a rolling start. Press claim its a 2100m course, but my GPS tells me its more like 2250m. The average splits given below are based on the assumption that the course is 2250m. As usual I have GPS traces: M1 and M2. M1 were in the MasA/B category (winning time 00:07:36) due to the presence of Dr James "I've got a point" Howard; M2 were in the M Nov (winning time 00:08:27) which M1 might well have won, had we s/Dr H/Someone else/. Although he does tend to make us go faster so is well worth including. The "two" crews ahead of M1 were the same Robs crew, racing twice. Fastest overall were Downing (7:10); Caius didn't deign to enter. Aside: I coxed the M2 crew, an exciting experience. My calls are getting much better, and my lines were OK except for Grassy, where I avoided a Jesus-style handbrake turn, but only just. Top-tip for self-aware crews: bowside need to pull a bit harder, and strokeside can afford to slacken off a little, as you go round Grassy.